Henry Hawkins surprised everybody with his fruit-growing success near Highbury. Despite growing in tough clay soil that was considered unsuitable for fruit trees, Hawkins’ management and growing techniques produced trees full of apples, pears, medlars, peaches, nectarines, apricots, plums and cherries. When his Belvedere Nursery was well established, he bought more land in Soldier’s Bay and proved everyone wrong by planting his trees at shallow depths, on steep southerly slopes. The clay soil was even heavier here than in Highbury, yet the trees still thrived. His desire to find things out for himself, over listening to others, made his success what it was. This attitude is what caused him to be respected as one of the top nurserymen in Auckland. Hawkins himself was born on September 5 1808 in Bath, England. He lived a very respectable 94 years until he died in Birkenhead on August 13 1902. 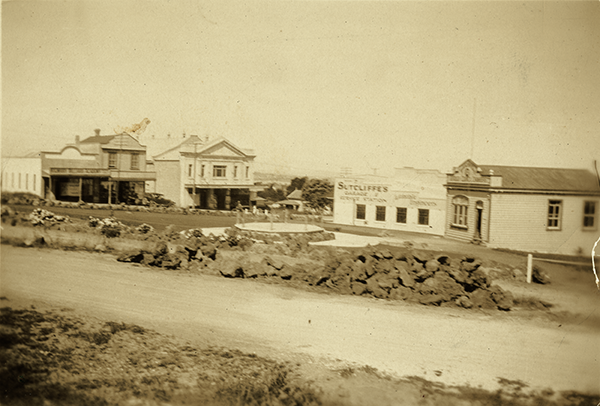 The Hawkins grocery store, at 245 Hinemoa Street, was built in 1920. Adjacent to the double-level S. Roberts General Providers, it was built as a single level building with an upright facade, in a very early simple art deco style. It has a plain parapet with curved pediment and cornice, with the verandah originally being supported by wooden posts, with an upright fascia for signage. The building is one of the two earliest commercial buildings in the Highbury centre, along with the general store next door.